Two weeks ago I began my commitment to the 40 Days to Personal Revolution yoga program. Today marks the end of Week 2 and I thought I’d take a few minutes to share how my first 14 days have gone. First, in a moment of honesty, I have not met my goal of practicing every day. Try as I might to avoid it, life has simply gotten in the way at times. Both weeks, I was able to practice 5/7 days, far more yoga than I had been doing before this commitment! Week One: The focus of this week’s practice was “presence.” I felt the irony of this focus during my first at-home yoga session this week. Using my laptop to play the podcasts from the program, I mistakenly left my work email window open. During the final moments of the practice, an email popped up from one of my bosses and the urge to read it was overwhelming. Even seeing the email and hearing the noise my computer made as it came in was enough to take me away from my focus on my body, from the “presence” I was supposed to have during yoga. Lesson learned: close all other windows, tabs and distractions on my computer and leave open only the podcast. Eliminating all distractions with an at-home practice is next to impossible. 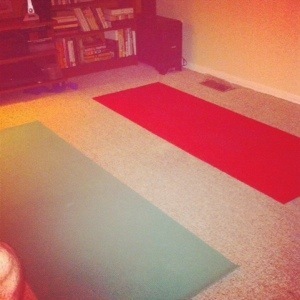 I have a dog and two cats, who mysteriously like to show up nearby when I roll out my yoga mat. A husband and two children who need to go about their business in the house too. A neighbor who loves his snowblower doesn’t exactly help. But, through all the noise, I’m learning to turn my focus inward and try to hear only the sound of my breath and the voice of the instructor coming from my computer speakers. The podcasts for week one were a 20 minute and a 90 minute session. I tried both and really enjoyed the 90 minute podcast, complete with plenty of wheel pose practice. 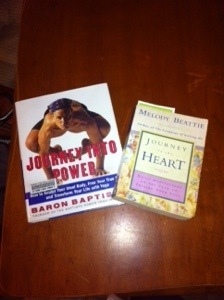 I also enjoyed continued reading of Journey into Power by Baron Baptiste and a daily book of reflections that my yoga studio uses during class (pictured below). Week Two: The focus of this week’s practice was “Vitality.” The podcast session length increased this week, with the shorter practice going about 35 minutes. I did not use the longer podcast at all during this week and was on the path to completing a session every day until illness struck. The irony (again!) is not lost on me that during a week of focusing on vitality, I was hit with the worst sinus infection I have had in years. I awoke this past Saturday feeling as if I had been hit by a bus overnight. I had no voice and even lifting my arm to hold my coffee mug was a challenge. I’m not sure if it’s because I am not sick often, but when I do catch a bug, it knocks me out. After trying to hold out and believe that I “just had a bad cold,” I relented Sunday and headed to the doctor and got the sinus infection diagnosis. Z-pac to the rescue! The 35 minute session this week was wonderful. I truly enjoyed the instructor’s guidance and practiced both crow and wheel pose during each of the 5 times I completed the session. These poses remain challenging for me, but I’m improving, albeit slowly, with each of them. I enjoyed Phil joining me for a couple of the sessions. He’s far less fearful of falling and pushes me (gently) to stop worrying and go for it-especially with crow. I’m going to keep practicing. I’m hopeful that with illness at bay, I will complete all 7 days this week. I’m headed back to my local yoga studio for a session of heated yoga tonight, a welcome relief from our subzero temperatures in Cleveland, and I’m practicing in the atrium of my beloved Cleveland Museum of Art this Saturday! I signed up for this free event a few weeks ago and am thrilled to be a part of it. If I don’t make all 7 sessions this week, I’m also prepared to forgive myself and keep moving forward. I think that one of my most important lessons so far from this work is that I have to push myself gently, but not in such a way that I fail to listen to my body. Are you completing a 40 Days Program? New to yoga and just getting started? I’d love to hear about your practice.